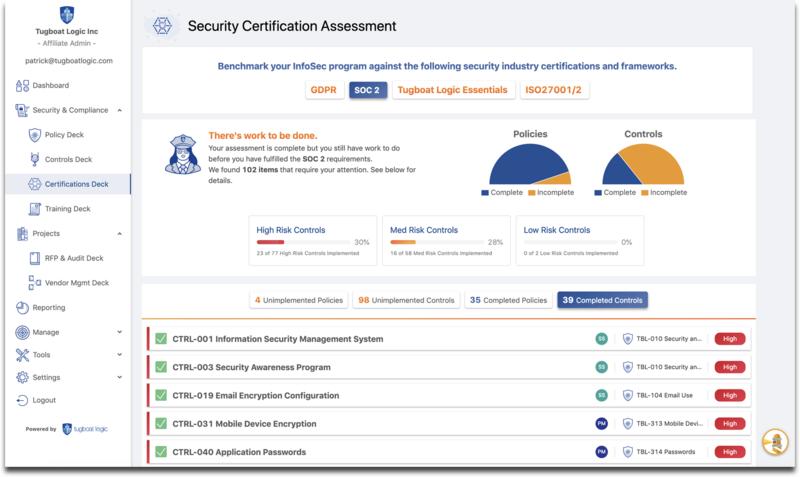 New offering from Tugboat Logic reduces the time, complexity and cost associated with obtaining certifications such as SOC 2 and ISO27001 by up to 60% March 12, 2019 (SAN FRANCISCO) - Tugboat Logic today announced the latest release of its Virtual CISO Platform, which includes the first fully automated Security Certification Management solution to help organizations obtain industry security certifications, such as SOC 2 and ISO27001 , in less time and at half the cost of traditional solutions. Given increased regulations and greater frequency of cyber attacks, customers are requiring their vendors to prove they are secure by providing third-party attestation of their security policies and controls through certifications such as SOC 2 Type 1 & 2 and ISO27001/2. These certification processes can be confusing, time-consuming and costly exercises for organizations to complete. In this latest product release, Tugboat Logic has demystified and automated the process of preparing for these certifications so customers can do it themselves more quickly and with confidence. 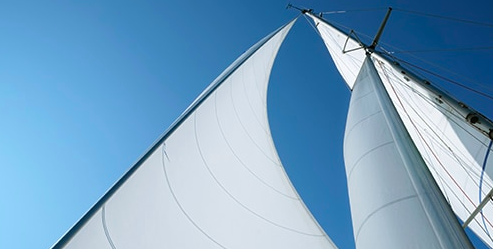 Tugboat has prebuilt policies and controls that are mapped against popular industry frameworks such as SOC 2, ISO27001, GDPR, and more, so organizations can instantly visualize gaps in their security program, assign and track implementation of missing controls, and provide evidentiary proof to auditors and clients alike that they are in compliance with these frameworks. As an evergreen InfoSec program system of record, organizations can then leverage the work they completed for one certification to achieve other certifications, and to easily manage renewals of their existing certifications. “During the sales cycle, it has become more commonplace for clients to request vendors prove they are SOC 2 or ISO27001 certified, but many companies struggle with the complexity and cost involved with the process of security certification, said Tugboat Logic CEO, Ray Kruck. “Tugboat Logic’s mission is to create a DIY tool that helps make this process less costly and faster so they can prove compliance and sell more effectively.” “Tugboat Logic is an existential necessity for my business,” said HYP3R CEO, Carlos Garcia. “As a marketing analytics platform, it is paramount for HYP3R to prove to our customers and partners that their data is secure. Tugboat Logic helped us prove compliance and in the process unlocked key wins for our business.” Tugboat Logic’s Security Certification Management Module is available now as an add-on to its base Tugboat Logic Essentials package for $499 per month, saving customers up to 60% over traditional certification preparation solutions. Learn more about Tugboat Logic.